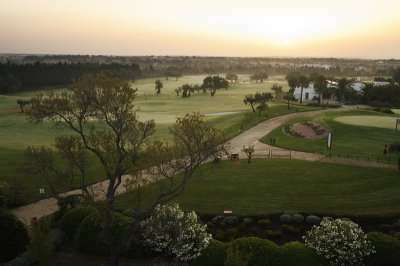 Located in the heart of the traditional fishing village of Tavira, the four-star Vila Galé Tavira boasts a perfect location for golfers looking to explore a true Portuguese town whilst still being close to some excellent courses. This modern hotel has excellent rates at fantastic value, making it an unbeatable option for your next golf holiday in the Algarve. You will not find a McDonalds, a "greasy spoon" or neon lights in Tavira; only traditional and charming restaurants, bars and markets - a welcoming change for some! This hotel is highly recommended for those looking for a bit of the real Portugal as opposed to the other lively resorts in the Algarve; here visitors can easily embrace local Portuguese culture. Picturesque views are provided throughout this idyllic town, with its quiet cobbled streets and white washed buildings. All of the beaches in Tavira are located on the Tavira Beach, where there is an impressive seven kilometres of golden sands with an excellent range of bars, restaurants, water sports and even a few beach clubs. At the Vila Gale Tavira, golfers can enjoy the best of both worlds; authentic Portuguese culture at their fingertips as well as some of the Algarve’s most prestigious golf courses in close proximity. 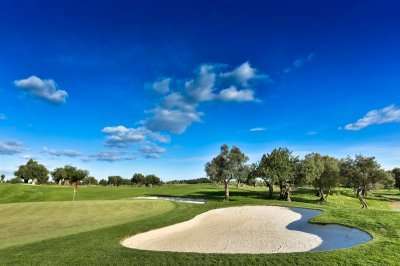 For example, the Quinta da Ria and the Quinta de Cima are widely considered to be among some of the best golf courses in the Algarve and are both located approximately a fifteen-minute drive away from the hotel. Consistent with the accommodation standards in the other Vila Gale hotels, the Vila Gale Tavira offers its guests spacious and lavish guest rooms, fully equipped with all of the essentials needed for a comfortable stay. Rooms feature Moorish interiors, with tiled floors and glass doors. All of the rooms include large private balconies or terraces so that guests can make the most of the hotel’s central position, with views extending across the hotel’s manicured gardens and pool area. Amenities in the rooms include air conditioning, a mini bar, Wi-Fi (charges may apply) and a large en suite bathroom. The Vila Gale Tavira offers its guests an excellent range of leisure facilities, including a large outdoor swimming pool, lined with sun beds and parasols and there is also a heated indoor swimming pool. Furthermore, there is also an air-conditioned fitness centre as well as an excellent spa facility with a sauna, whirlpool and a range of massage treatments. The Aladino Restaurant serves up a large buffet full of international favourites for breakfast, lunch and dinner as well an a la carte menu for evening meals. Guests can head to the Alibabar for a range of wines, beers, cocktails and spirits after their meal. The Pool Bar is also open during the summer season so that guests need not travel far from their sun bed for a refreshing drink.